For Christmas my twelve year old, Lucas, chose to forego stocking stuffers and buy a goat to be donated in his name thru World Vision. He insisted on a goat, not a lamb or chickens. This decision really impressed me … the fact that he thought about it as he flipped the pages of the World Vision Catalog (a sobering read). We talked about what it meant to sacrifice and how his stocking would be empty on Christmas morning, but what that would mean for a family that doesn’t have food or milk every day. I can understand why my nine year old decided not to give up the stocking loot , he is young and it is fine with me that he did not participate. This was a gift I wanted to be given freely and in the spirit of sacrifice. Sacrifice is painful and I am pretty sure I would have not made the same decision he did when I was nine or twelve. It really touched my heart that Lucas expressed compassion at such a young age. As a general internal reflex I find it easier to turn my head to children bloated, lying on the ground with flies dancing around their faces with big round hungry eyes. I don’t go there easily. It is worlds away from my comfy home, healthy family and cupboards filled with food. A holiday prayer that does travel my heart this time of year is for the children who are in the hospital over the Christmas Season. Most Americans celebrate the birth of Christ, but under that umbrella falls all these wonderful Christmas happenings….creating gingerbread houses, driving around to see house lights, sitting on Santa’s lap, baking cookies, spending Christmas Eve with friends and family, going to church and the best one of all… waking up in your OWN BED in your OWN HOUSE on Christmas morning. Hospitalized children experience none of that. Yeah, Santa visits the hospital, but it aint nothing like Christmas at home. 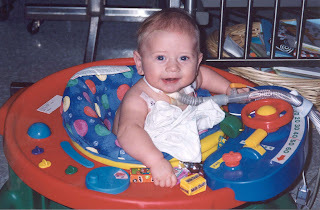 Baby Lucas was released from the hospital nine days before his first Christmas in 1997. This particular admission for him was for five months and sixteen days in the Intensive Care Unit. In his first year while being hospitalized, Halloween came and went and I did not care that Lucas did not have a cute baby costume. Thanksgiving came and went and I ached to have my baby home, but just accepted that it would not happen and was thankful he was alive. But the thought of his first Christmas being spent in an ICU crib just ate me up inside. I wanted nothing else but for our family of three to be cuddled up in our nest and NOT humming Silent Night to the bleeping of hospital machines. Arriving home on December 16, 1997 was the best gift of any Christmas so far. Sleeping together under the same roof, with my ten month old down the hall and my husband next to me was HUGE. Just knowing that I could hug my baby first thing Christmas morning and hold him without a drive to UCLA was a gift words would only cheat. Spending so much time in the hospital in his first year of life affected some development that, thankfully, he has caught up with over the years. Lucas has had his share of medical procedures in the last 10 years, enough to make him NOT like hospitals or needles and to create a tender, compassionate heart. He has befriended other children with heart problems that are actively being treated for serious issues of life or death. Possibly because of what he has lived and seen, (the stuff most healthy kids are never touched by) is the very reason he could decide to donate a goat to a needy, starving family, instead of insisting on a stocking full of more ‘stuff’ that provides short lived excitement. When I look at the picture above, that was taken in 1997,at the hospital before being realeased for our first Christmas at home, I remember how diffcult that year was and how far God has carried Lucas...sitting back my eyes are once again opened to the truth that bad times don’t last forever and that God can turn even the icky, painful situations into something beautiful. Like the saying goes…God works slowly, but he is always right on time….. my heart celebrates that He not only sent his Son, but this Christmas, through Lucas, he sent a goat!